Back in 2003 I reviewed Demon Lung's The Hundredth Name for Ghost Cult Magazine giving the album a 9/10 and likened it to a “modern doom masterpiece.” Time has done little to alter that sentiment as the CD still finds itself in rotation in the car. However, it might be usurped by the Vegas group's latest offering, A Dracula. This time the doom quintet base their concept on the 1977 flick Alucarda, the gist of which is this: the daughter of Satan falls in love with a nun and converts her to the dark side. She is killed by her fellow nuns, is resurrected by Satan's Daughter and together they exact their revenge on the nuns and the world. How cool is that?! The band once again worked with Billy Anderson. His engineering helps give the music that penetrating warmth that envelopes the scene like a fog, obscuring all that lay beyond the here and now, allowing the listener to become one with the music. Music that somewhat manages to be even more epic than its predecessor. After the acoustic intro “Rursumque Alucarda”, Demon Lung launch into A Dracula with “Behold, the Daughter”. The track features some swift rhythms that have no place on a doom record but Demon Lung make them work. Hey, Cathedral didn't drag their feet the whole time either. As we're introduced to the evil temptress those rhythms bring trepidation and mimic the pounding hearts of those confronting the Daughter. It does slow to groovier movements and ominous doom however. Through it all Shanda Fredrick's perfectly suited voice leaves no doubt that this is doom no matter the tempo. Throughout A Dracula we can feel this dynamism. Fast sections give way to pounding riffs in a sludge vein as well as chugging doom signalling action of a most dark sort. One even finds quieter moments with Fredrick's croon dominating. Those times are ones of abject sorrow yet are usually followed by the muscular doom we've come to expect. One can think of and feel those times like tears drying and a resolve building into the resulting destruction. Revenge. Time and again the unholy trinity of Phil Burns and Brent Lynch (guitar) and Jason Lamb (bass) serve up powerful and epic riffs reaching the highest spires and the deepest dungeons. Their unity is as natural as it is overpowering. Undoubtedly doomy tone and a bevy of riffs, punctuated by concussive chords slam the listener hard enough to make the heart skip a beat and the variety of moods pieced fluidly together reflect the drama of the narrative. All this ensures not only a feeling of doom but also of terror through those racing tempos, barely perceptible, more felt than heard atmospheric touches and Fredrick's coldly seductive delivery. Saving perhaps the best for last, A Dracula concludes with “Raped by the Serpent”, where all things come to a head and Fredrick puts forth her most powerful performance. 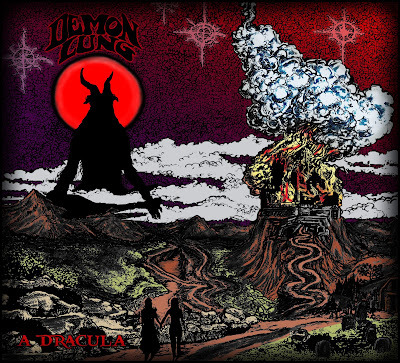 There is no doubt Demon Lung have crafted a superb doom album here but what makes it special, and so intriguing, is how they're able to adapt the film into the lyrical concept without it sounding cheap. Especially without the use of samples. Other than the arresting chorus on the closer, my favourite lyric is from “Deny the Saviour” with “You worship death, I worship life.” I love that this is the Daughter speaking to the nun. With A Dracula Demon Lung have once again rendered my soul to the darkness and put forth an album I'll be sure to listen to for a long time to come. Lurching doom, terror-filled runs more akin to death metal, Jeremy Brenton's thunderous percussion and Fredrick's (splendid) voice comprise the pieces of this excellent (sure, I'll say it again) masterpiece.